June 28, 2012 - by benign0 - 11 Comments. The following was snapped by a peeved constituent including as a caption “i’m at a loss for words.. let’s go, anti-epal bill!!!”. 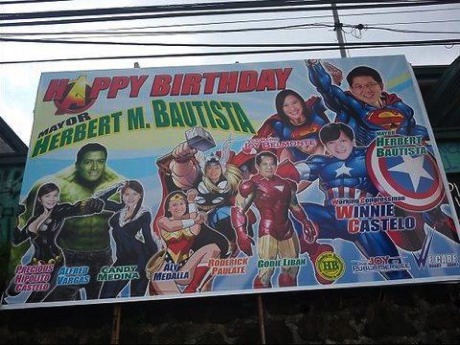 The billboard is a greeting to Quezon City Mayor Herbert Bautista on the occasion of his birthday. Senator Miriam Santiago is sponsoring a bill dubbed the “Anti-Epal Bill” that aims to penalise politicians who use public funds to exhibit their names and likenesses in public areas. For more information on the Anti-Epal Bill, refer to this Blogwatch.tv article. #1 tacky, vain, pompous. Typical pinoy KSP behavior of patting yourself on the back. #2 Compare and contrast : texts I get every so often of Binay’s results in surveys. Dafuq is that? Having been raised abroad, I often find it weird and absurd what politicians do here in the Philippines. This is something you show off during a party, not as a banner for the entire public to see. *Sorry, I meant billboard, not banner. How about the Joel Villanueva TESDA Billboards? Have you seen the one on Balintawak NLEX? Mas malupit yun. Kinda reminds me of how Saddam used to remind his people how great he is. Hyper kurap yung mayor bistek na yan. Kung tumakbo man na mayor yung paralitiko na ballpen vendor dun sa quadrangle ng QChall, iboboto ko na yon, matanggal lang yang inutil na bistek na yan! kilala niyo bo yung superhero na pinoportray ni Candy Medina?